So sorry I didn't read other reviews concerning this product. If I could rate it a 0 I would. I was so shocked when I received the 3 vinyl tablecloths not only the poor quality of them but the high price I had to pay. Needless to say they are being returned and of course I have to pay th shipping fee to return them. I did send an email to customer service stating how this item is so overpriced and was told the information would be forwarded to the merchandising dept. Many of the customers rate this product a 1 and for that reason I can't understand why something has not been done...either lower the price because of the poor quality or just discontinue them. We wanted to cover our nice 24" x 48" (2 feet by 4 feet) folding table next to our new washer and dryer. The tablecover instructions suggested putting the cover in a dryer to get the wrinkles out of it - somehow putting meltable plastic in a dryer did not seem like a good idea to us. Anyway we didn't have any problems with wrinkles. Our problems were that the tablecover did not fit over our 3" deep tabletop as one of the tables in the photo showed. We even tried using bedsheet straps to hold down the corners, but they kept sliding off the vinyl cloth. Only the corners of the cover have elastic and the instructions suggested using tape to hold down the cover. We can use plain cheaper plastic from a local store if we wanted to TAPE something down on our nice new table. We wanted to give the cover to a friend to use on her 1" thick table and it would not stay on her narrower tabletop either. At the price this tablecover cost us, we felt it should have worked as depicted in both the description and the photo (which shows a deeper tabletop as well as the narrower thickness tables). This product was grossly misrepresented in both the photo and description and we sent it back for a refund. [...] Yuck!! I rate this Zero stars! I was very disappointed with this product. You advertise "stay put elasticized corners" but there is only elastic on two sides which necessitates using tape to keep this item on the table without slipping. 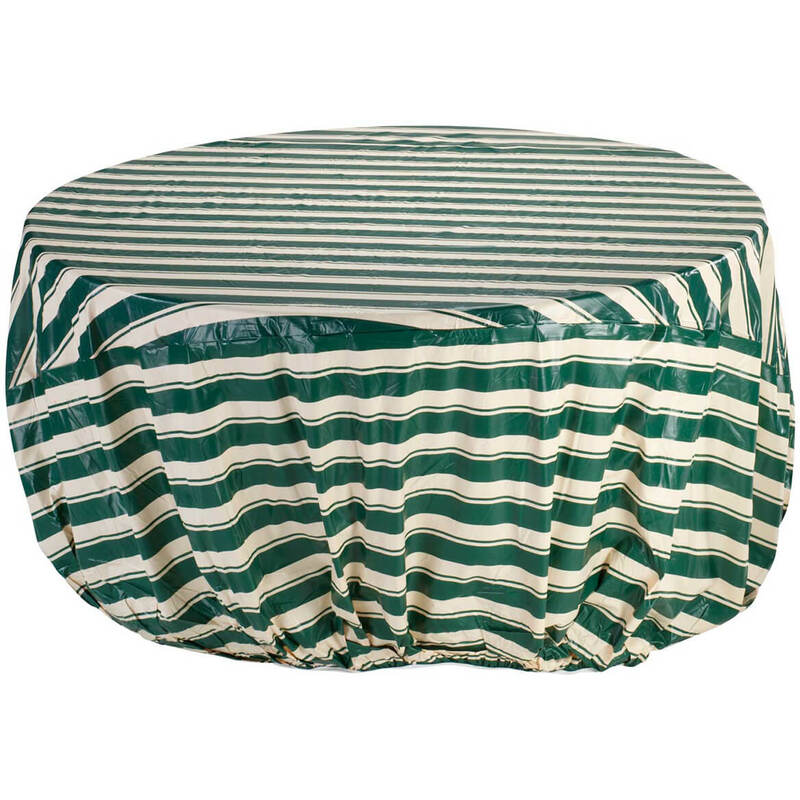 I have purchased similar table covers that are completely elasticized and stay perfectly taut on the table. That is what I expected from this product. idea but what good is it if it doesn't stay on the table!!! The covers were nice and sturdy but way too big for my card tables. I bought 3 so all my tables would match. 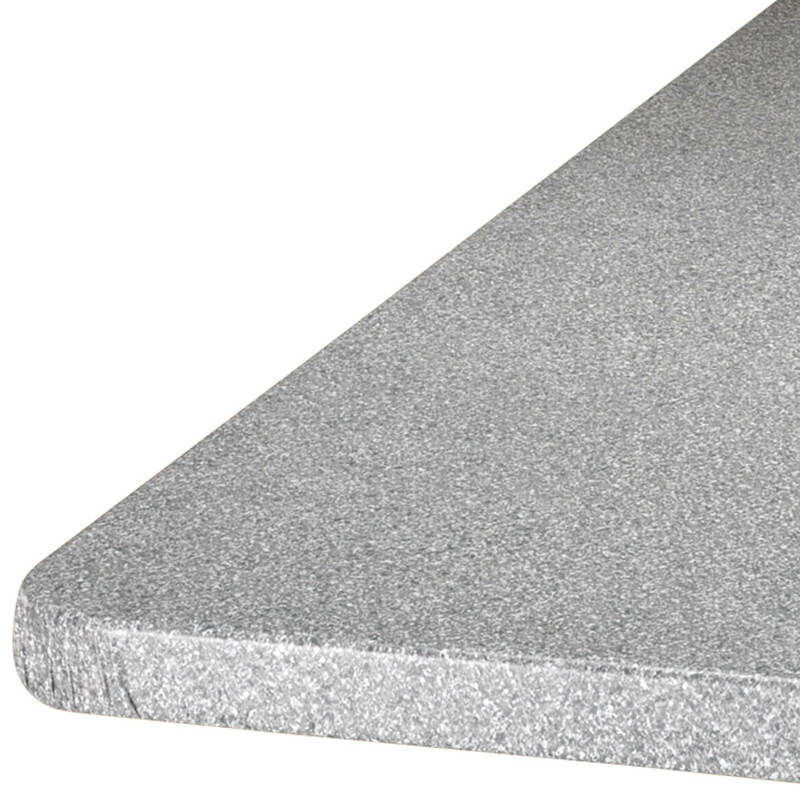 It suggests that you tuck in the sides but that does not work well - too bulky. I had to return all 3. I had only opened 1 of them and it just didn't fit well. The square size does not fit a standard card table snugly. It is too loose, so I couldn't really use it. I'm going to return it but i have been sick. No problem except it is to big. There is no way I can cut it down. I ordered it for a card table and it won't work. I wanted to have my drink table look different from the other banquet tables. The color looked to tacky for my upscale event. I will save for a cookout or picnic. We wanted to cover our folding table 24" x 48" in the garage to use it to fold our laundry and have an easy to clean vinyl cover. However, the table cover corner pockets would not fit over our folding table. We even tried to use bedsheet straps to hold down the corners but they slipped off the vinyl table cover. Our folding table is about 3" thick and the vinyl tablecloth probably wouldn't even fit over a 1" thick table. It was a poor design and way too much money. Only the corners have elastic. The manufacturer's instructions say to put in dryer to warm up the vinyl to take out the wrinkles but I don't think putting plastic in a dryer is a very good idea. Poor design, poor quality, poor instructions, too pricey. We don't usually return things but this was too much money to lose on a poor product. Very disappointed in how flimsy the material is for the price, and it keeps popping off the table. Better off with a vinyl tablecloth. Moved to new home. Bought tablecloth to fit our new 36 in. square table in our dining area. It has a glass top and was constantly cleaning it. So I decided to cover it, found your product and ordered it. The color I selected was perfect. However, it did not fit as described in the catalog. It bunched up and would not lie flat. I was told by your rep when ordering that it had elastic only on the corners but when I opened it it had elastic all around it. It would not smooth out and I decided the table was better without it. Gave this one star because there wasn't a choice of zero stars. Product was a total disappointment. 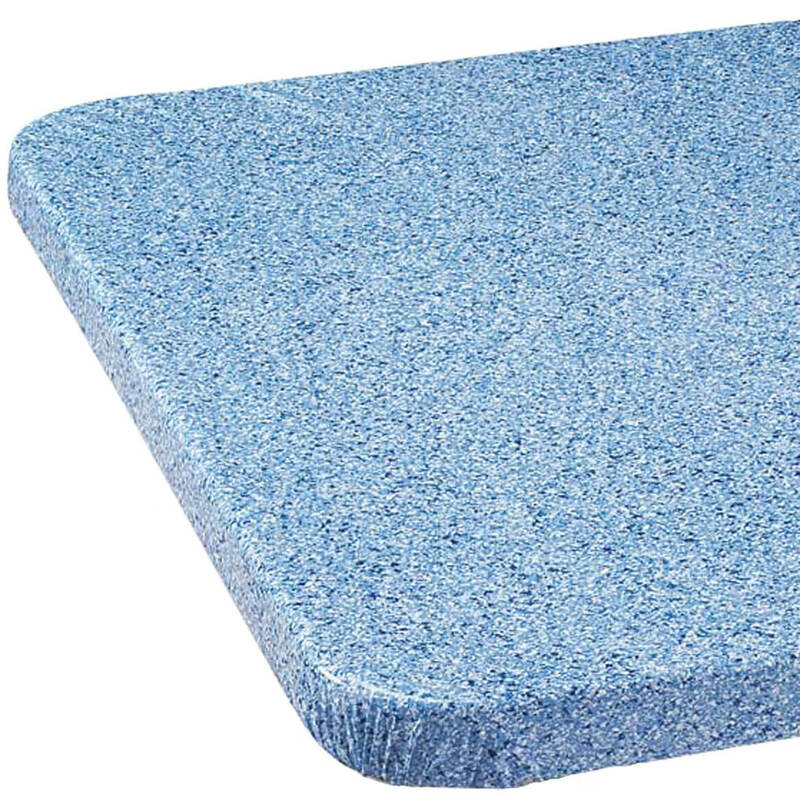 I've seen other elasticized table cloths which had elastic all around, stayed tight on table and were much thicker and I expected this to be similar but it failed in all areas. I wish I had read the other reviews before I ordered two of these in two different sizes. I have 2 tables for camping and needed covers for them !!! I think it will make my table of this size look nicer!!! I have three small tables that I have been wanting to cover and haven’t been able to find elasticized square covers. I was happy to see that Walter Drake had just what I wanted. I like the color and it's the right size for my table. Looking on-line and found what I was looking for at Walter Drake. especially if there are kids around. My card table has stains on it and looks dirty. This will give us a uniform color for all occasions. Wanted my plain folding table to have some pizzazz. 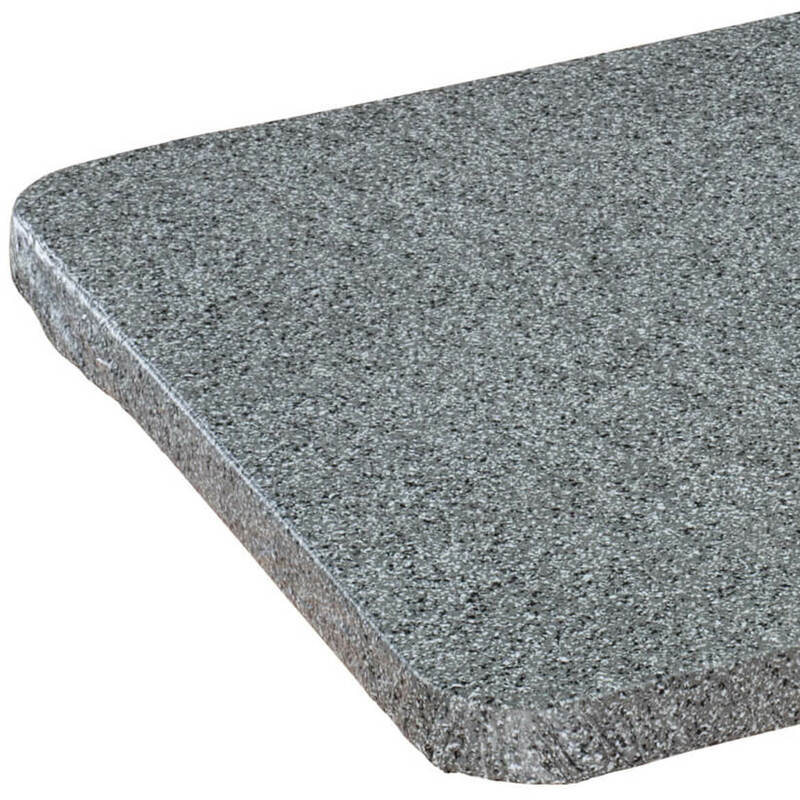 This will make it look like a fancy banquet table. Love the idea of the elasticized fit. No need for table clips or weighted objects to hold it down on a windy day. Seeing if it will fit our lunchroom tables. 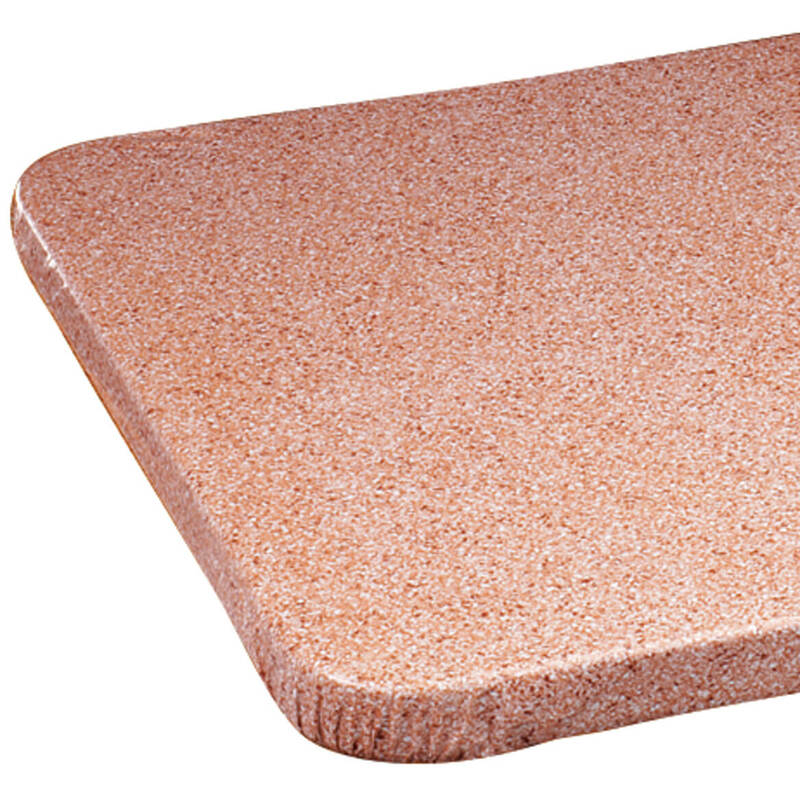 I bought one of these for a round glass table to play cards on. Everyone liked it so much and it fit so well, I'm getting one for an inexpensive bridge table. Have purchased others in the past and always satisfied. perfect for what I need great price this was hard to find anywhere else. we live full time in a rv and want our outside space to look nice. small size for folding table. It protects my card table and makes it look nicer. thought I would try it. My daughter is a teacher and she uses these tables in place of the standard desk in her classrooms. These covers keep them looking nice. I use my folding table in my office and having a cover would protect and make it look nice. Could not find in dept. stores in my area. I chose this cover in order to use my extra table when company comes. 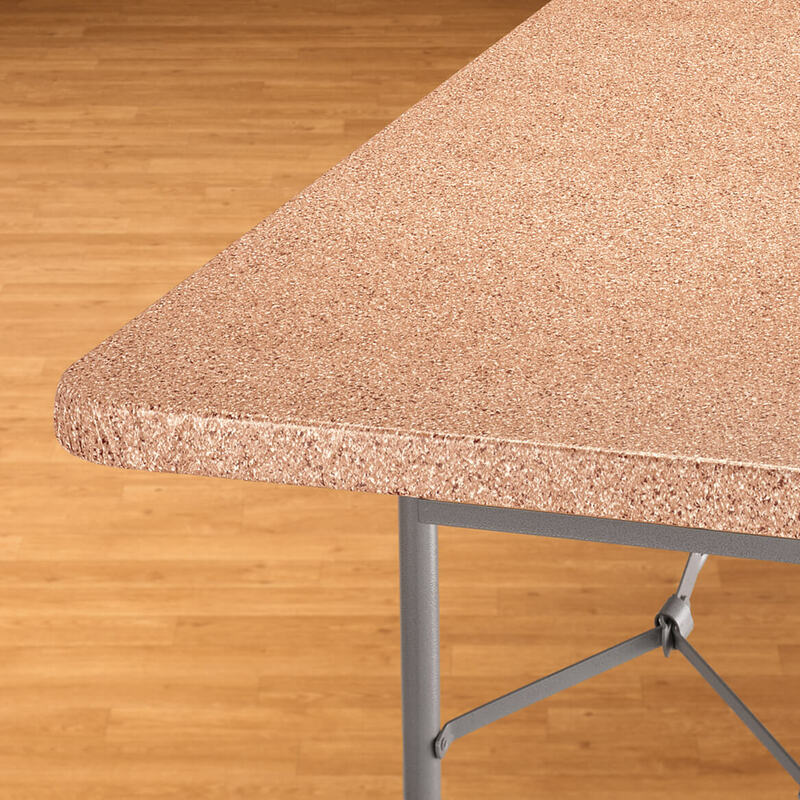 The table is sound but the top is stained and this will cover the table and clean up will be easy. Need exact size of a table that sits 10 people? BEST ANSWER: Thank you for your question. 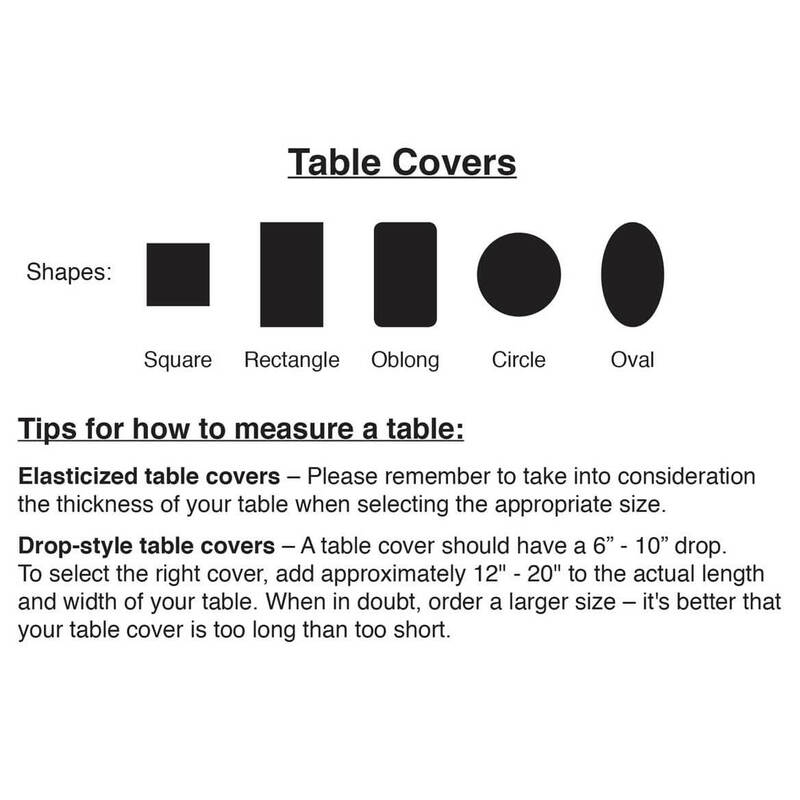 We suggest you measure you table to see what size table cover you need. We hope this information will be of help to you. I have a30" square card table. what size table cover would I use for fitted with elastic? BEST ANSWER: Thank you for your question. 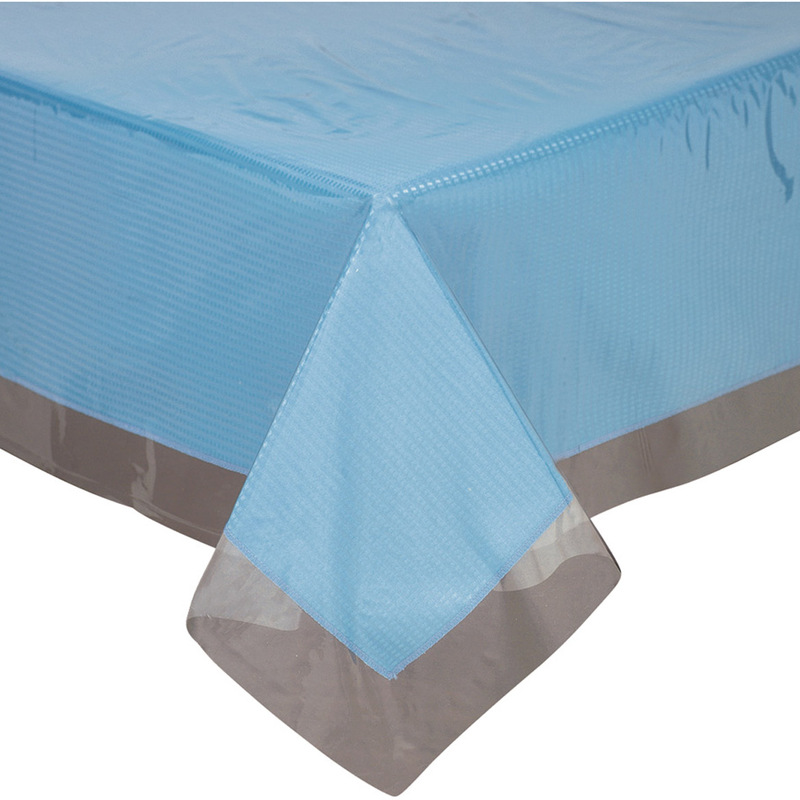 For the table size you have mentioned, we would suggest the 36" square size table cover. We hope this information will be of help to you. is the 36'' square tablecloth flannel backed? BEST ANSWER: Thank you for your question. 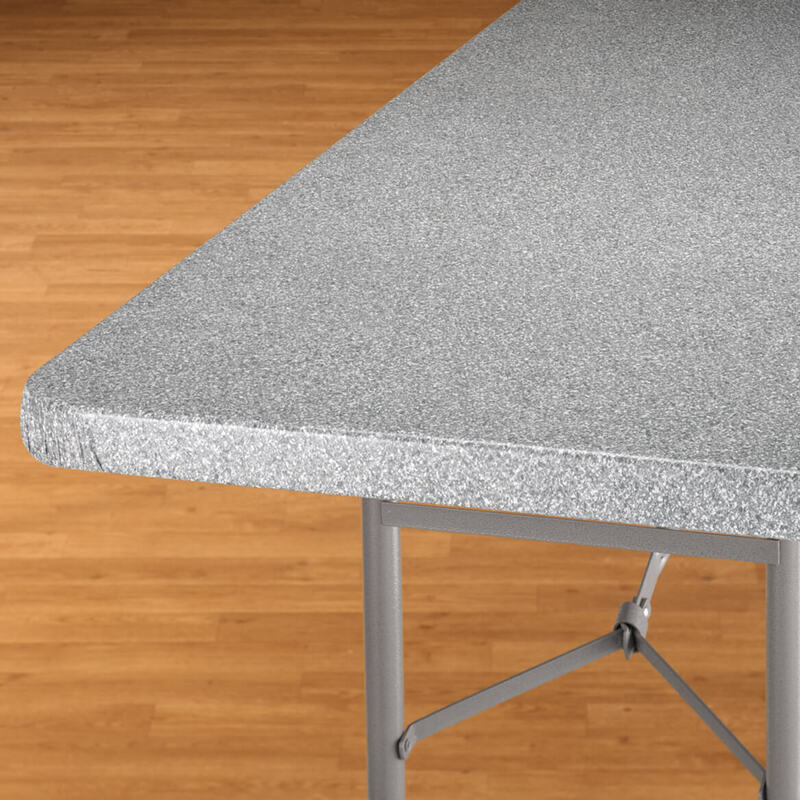 The Granite Elasticized Banquet Table Cover does have a flannel fleece back. We hope this information will be of help to you. Yes, it is flannel backed but the flannel is very thin. The tablecloth fits well and protects the table beneath from stains. Yes. I like the way the elasticizedcover fits. DO THEY HAVE THE HOLE FOR THE UMBRELLA? BEST ANSWER: Thank you for your question. Our banquet table covers do not have a hole in the middle for a umbrella. We hope this information will be of help to you. 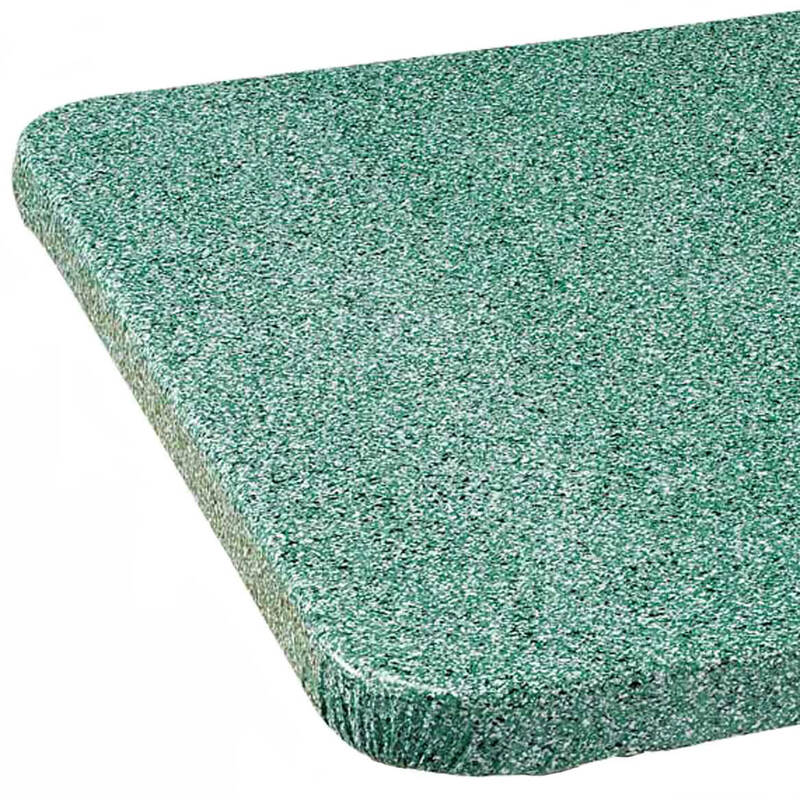 I have order before the green felt for square card tables, do to still have them? BEST ANSWER: Thank you for your question. Unfortunately we do not carry the card table covers. We hope this information will be of help to you. 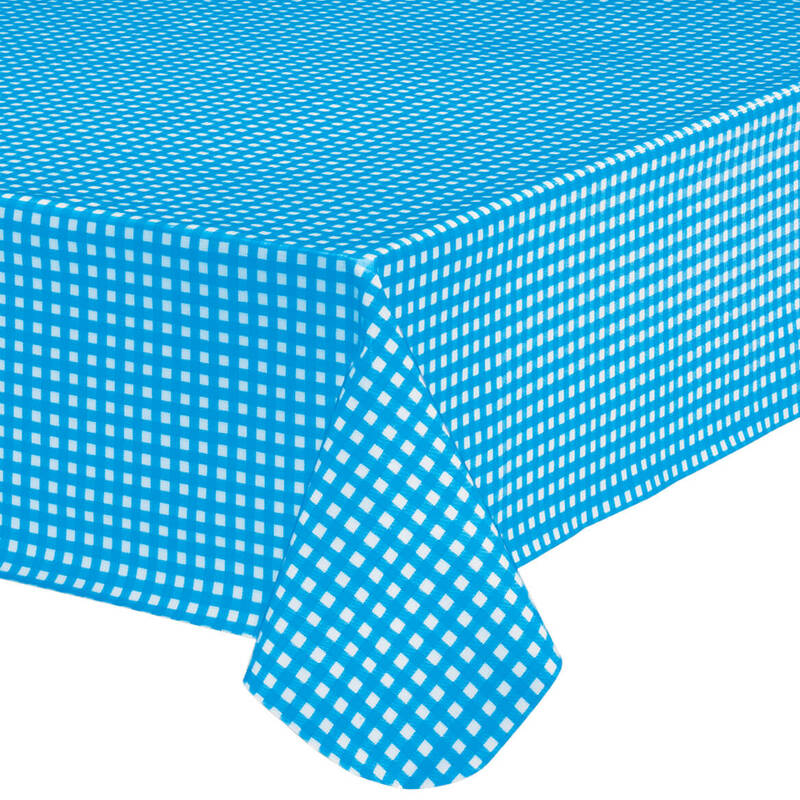 do you have an oblong elastiized tablecloth that is 95 inches long? 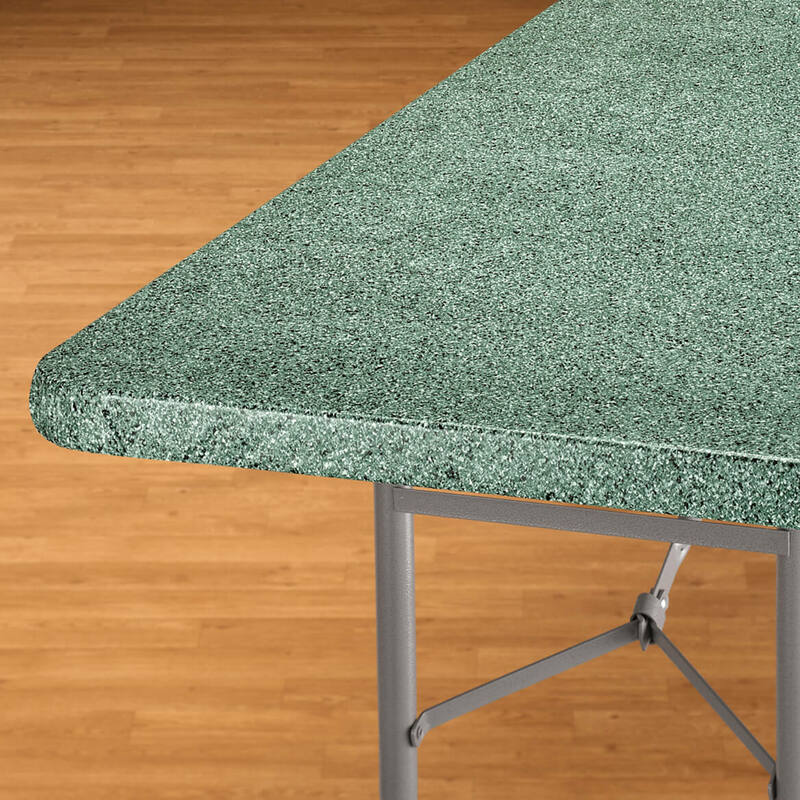 table surface is 72x30 with 2' thick , will your 72x30 cover fit? BEST ANSWER: Thank you for your question. 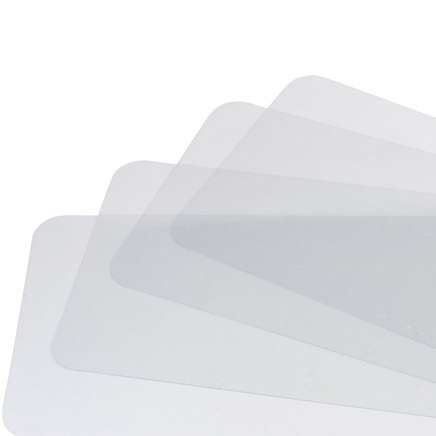 As with elastic cover you do want to include the size measurements in the size. The cover will more and likely be small for your table. We hope this information will be of help to you. will the oblong fit a rectangle 24 x 48"? does oblong mean rectangle? BEST ANSWER: Thank you for your question. Oblong is rectangular in size.We hope this information will be of help to you. I have a 24" by 36" rectangle table. What size fitted table cover would I use? BEST ANSWER: Thank you for your question. Unfortunately, we do not have a table cover that is in the size of 24" by 36". We do have a 36" square table cover and a 48" by 24" oblong cover. We hope this information will be of help to you. Youu0027ll love this floral vinyl tablecloth for its good looks, easy care, and great price! 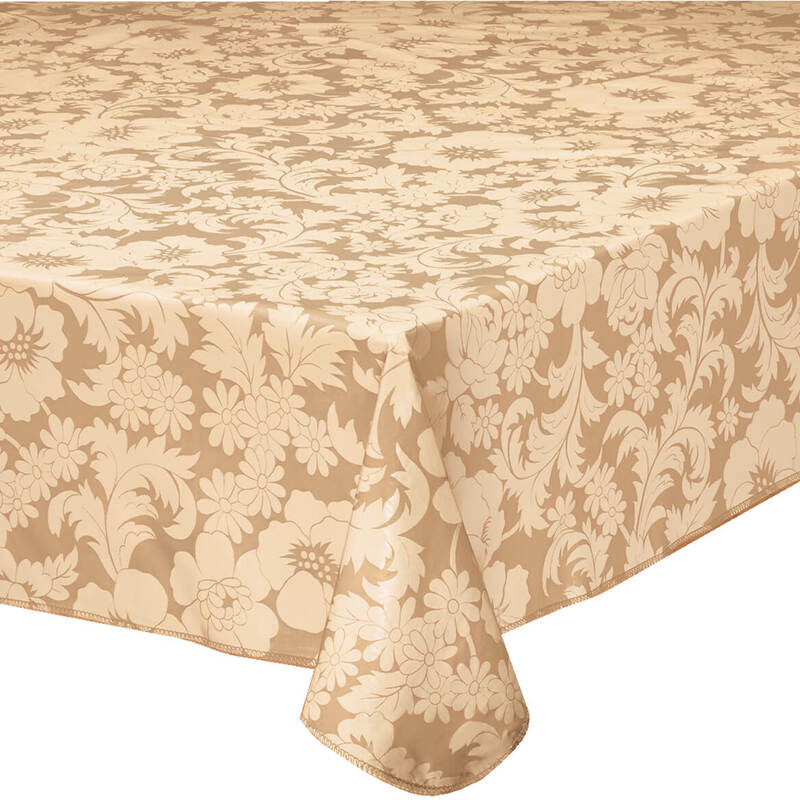 Bordeaux floral vinyl table cover has 100% polyester flannel backing. Wipe clean. Imported.